Reveals the key elements to good living and honest food: seasonal cooking. This book takes us back to our roots with her original recipes made from locally and seasonally sourced produce with recipes such as Warm Duck and Black Grape Salad from the Autumn menu, and Grilled Nectar... read full description below. This sophisticated cookbook reveals the key elements to good living and great honest food: seasonal cooking. Chef and gardener Laura Faire takes us back to our roots with her original recipes made from locally and seasonally sourced produce with temptations such as Warm Duck and Black Grape Salad from the Autumn menu, and Grilled Nectarines with Vanilla Mascarpone and Almonds from the Summer menu. Broken into seasons with sample menus for each, this rustic cookbook includes recipes for starters, sides and lunches, mains, puddings, stores and tisanes. There are also ideas for homemade staples and tips for growing herbs, fruit and vegetables through the year with advice for purchasing the best quality local free-range meat and seafood. This book of soul-warming and flavour-filled recipes made from natural wholefoods is charming, fully rounded and holistic - an inspiration for cooks and gardeners alike. 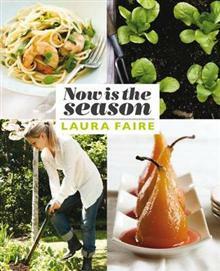 Laura Faire is a trained chef and a keen gardener, who lives simply with a small garden in Auckland, New Zealand. As a food writer she has contributed to a number of books, including Shop Local Eat Well, also published by New Holland, authored two books for Nestle, and she writes for several food and lifestyle publications. She appears monthly on the Good Morning television show making delicous, attainable food with flair. This is her first solo cookbook. Laura has worked extensively with Kieran Scott, an award-winning New Zealand food and lifestyle photographer and regular contributor to Cuisine magazine and over 25 cookbooks.